(Click the image to view full size) Our 1st attempt at making a Spirit Box that sweeps online IP Radio Station Broadcasts. Physical Spirit Boxes sweep radio stations through a radio signal in the air, so I have tried to replicate this for mobile devices by sweeping online radio station broadcasts over IP (Internet Protocol). When you run the app it will connect to my website (www.SpottedGhosts.com) and download a list of Internet stations. It will then connect to them all and randomly sweep through them playing a random sound from whatever radio station it has picked. Lets see if spirits can speak to us through IP Radio Station Broadcasts. This app needs an Internet Connection to work, either via Wifi or some other Data connection. 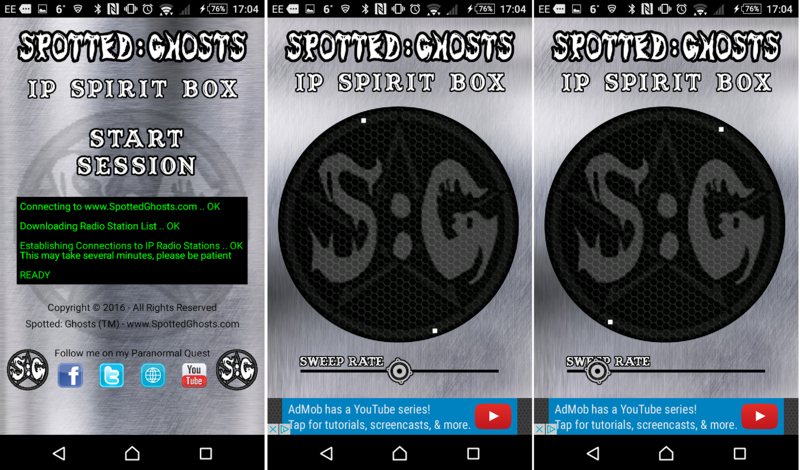 It creates a folder on your device called "SpottedGhosts/IPRadioSpiritBox"